make fun stuff / make stuff fun. 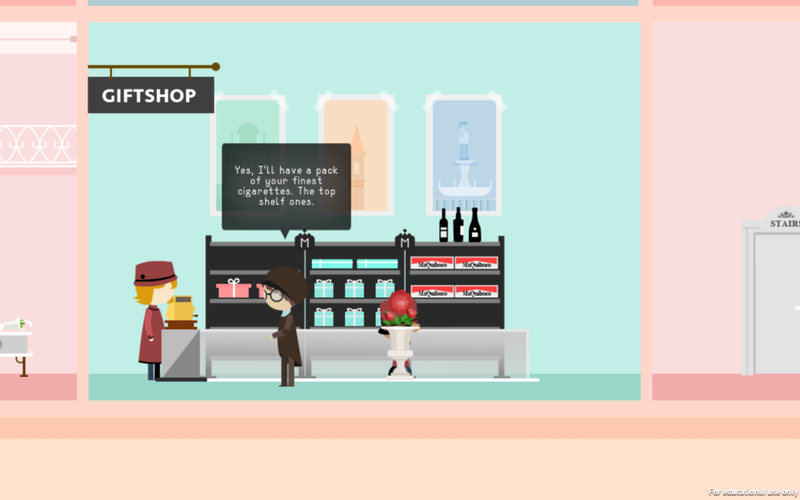 Maquisard is a charming game of snooping and investigation. As the lobby boy at a fancy hotel, the player will receive clues from the resistance to the identity of a government agent and will try to figure out their identity by snooping on the guests over the course of three days. Players must listen in on conversations, peek into rooms, and observe the guests’ habits in order to figure out which guests has all the traits of their target. It is a single-player puzzle game that will have an unique non-linear investigation gameplay and draw on the aesthetics of Wes Anderson’s film The Grand Budapest Hotel. Maquisard aims to charm the player. Drawing inspiration from French castles, Wes Anderson films, and Clue, we want to fill the game world with a quirky characters, beautiful environments, and music to delight the players. For the gameplay, Maquisard set out to explore three areas. We wanted to give old logic puzzles that one finds in magazines a new spin and use them in a game. We also wanted to examine how the loathsome act of snooping can be used to solve mysteries. Lastly, Maquisard studies how a “go where you want but can’t be everywhere” system plays out. I worked as a visual designer in the team, I was mainly focusing on the art direction and visual communication of the game. The theme of the game was inspired by Wes Anderson's movie, we also wanted to translate the aesthetic into the striking interactive experience. As the main scene of the game, the hotel is one of the most important visual elements. Functionally, the hotel was structured for fitting the gameplay content with production requirements. Aesthetically, it looks charming. Side-view Layout: For the visual communication efficiency. Coordinated with the camera behaviors to provide the best visual perspective for showing most details and creating the focus. Multiple Layers: For the gameplay functionality. Coordinated with the character behaviors: moving, eavesdropping, and snooping into the room. Interactive Elements: For the game content requirements. Coordinated with the scheduled events and character behaviors. Color Palette: Clear, Elegant with some variation. 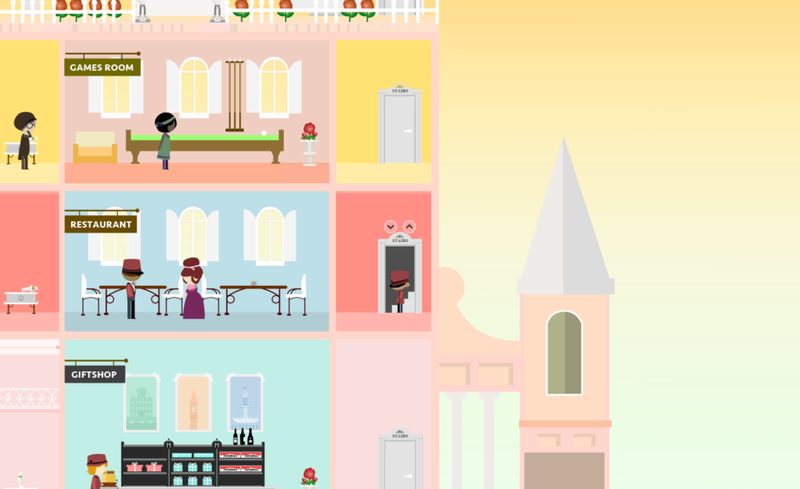 Maquisard presents players with a hotel that they can explore. 9 different NPCs, with their own unique designs and animations, inhabit and roam the hotel. Players can employ snooping mechanics of eavesdropping, listening into rooms, observation, and sussing out reactions with items, to obtain information from the NPCs. An original soundtrack accompanies the players as they uncover the mystery. Players can expect 30 minutes of gameplay, including a tutorial level.